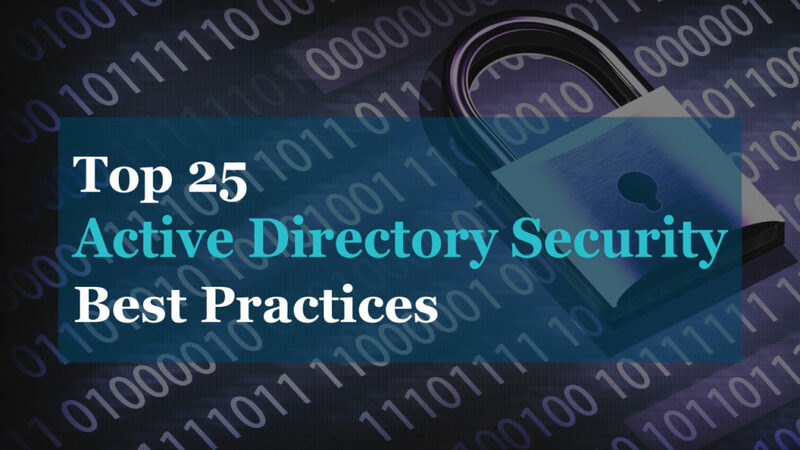 Creating Active Directory user accounts is a dreaded task that is time consuming and prone to errors. Thankfully there are tools available that make creating and importing bulk AD accounts a breeze. These steps will be different for each organization, the point is it’s a lot of manually work especially when you have many accounts to create. 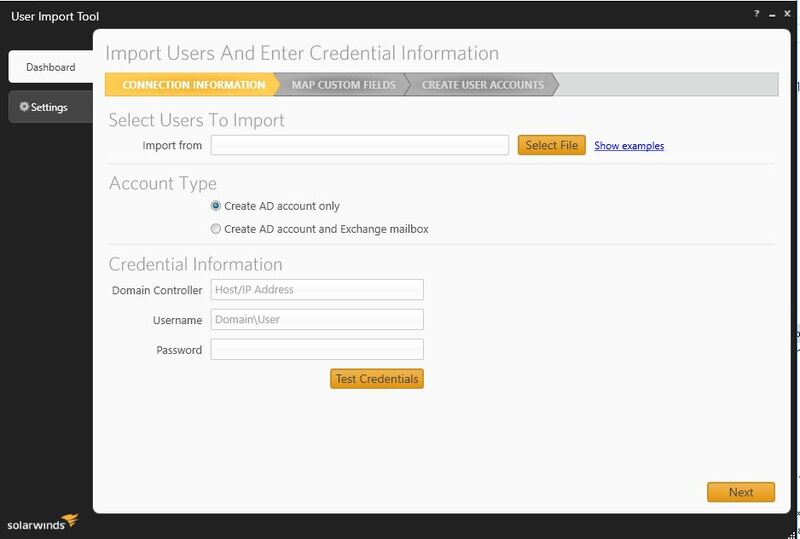 Let’s look at some tools that will automate the account creation process and allow bulk importing from a csv. PowerShell is probably the most commonly used tool for creating bulk AD accounts. PowerShell provides the flexibility to do almost anything you want. For example, it can create office 365 email accounts, set permissions on folders, add users to groups, move users to a specific folder and much more. If you are familiar with PowerShell or want to take on this new task then it is the best choice. Although you can find plenty of pre-built scripts online, you will want to modify it to work in your environment. If you are new to PowerShell or just looking for a simple import from csv option then I would look at the other tools I have listed below. 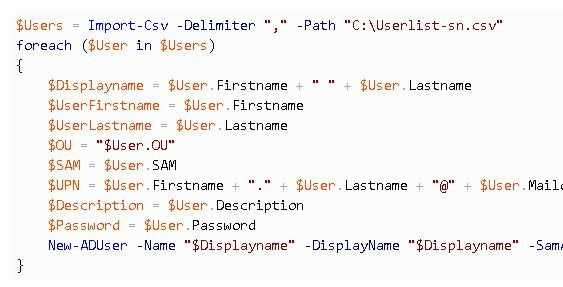 Below is a screenshot of a Powershell script that imports accounts from a CSV. If you want more info on the code below then check out this Microsoft TechNet article. 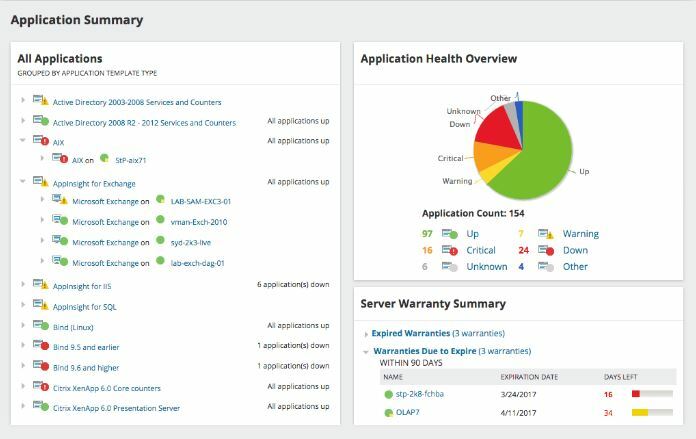 SolarWinds bulk import tool is part of the Admin Bundle that has three FREE tools. The great thing about these tools is they are free and very easy to use. The install was very quick and the interface was very user friendly. I was able to figure out how to import bulk accounts in minutes without looking at the manually. The bulk import tool allows you to select a csv file and then map those fields to attributes in Active Directory. 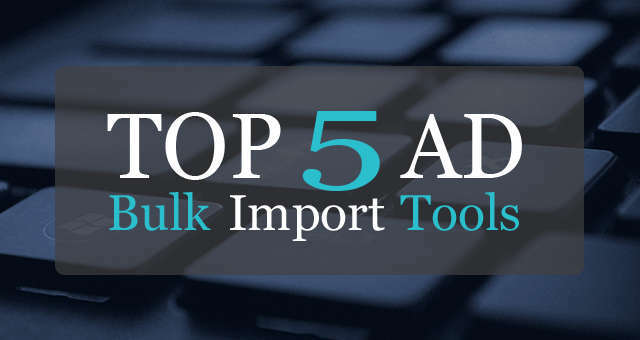 This gives you more flexibility and control of your spreadsheet and the import process. 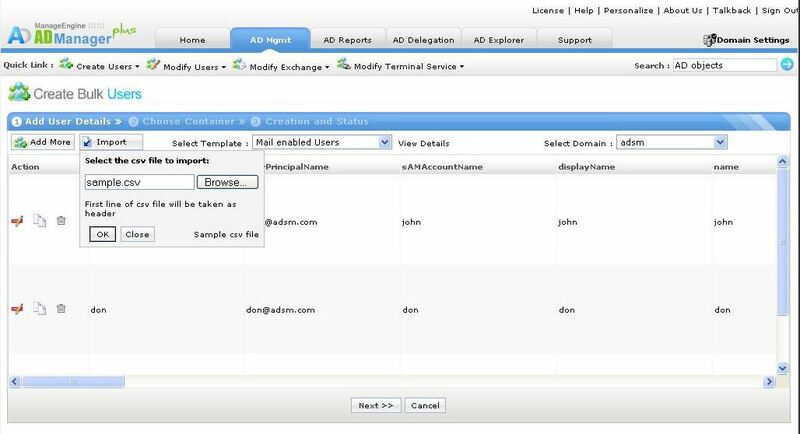 ADManager Plus is a web based tool that allows you to create multiple users accounts in a single action. One nice feature of this tool has is you can create templates that have values already set, this could be handy for creating bulk accounts for a specific department. Another option is this tool allows you to delegate rights to non- system admins such as helpdesk. Delegating this task is a great option and frees up time to focus on other tasks. ADManager is a paid tool but it comes with a bundle of features that may interest you. Like bulk editing accounts, import, export, create exchange accounts, move users and more. ADManager comes in two editions, Standard and Professional and both are an annual subscription. Standard starts at $495 for 2 technicians. Hyena is a complete suite of management tools that has a user importing option. Its options for importing are simple, select a delimited file, choose where to import and it will handle the rest. This tool may have the least options for importing but if you’re looking to import from a file then this will get it done. 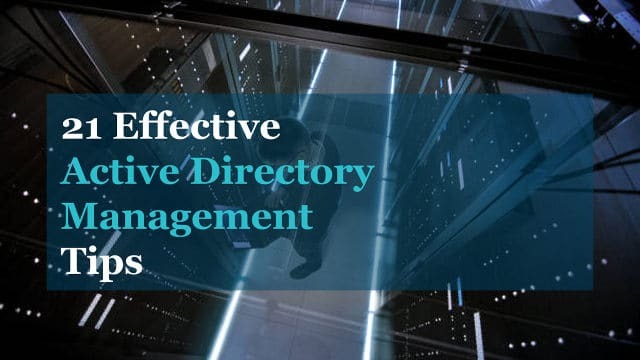 I included this tool because it includes a suite of options for managing servers and Active Directory. It has a lot of features that the built in Active Directory users and computers tool is lacking. Pricing starts at $329 for 1-2 license. 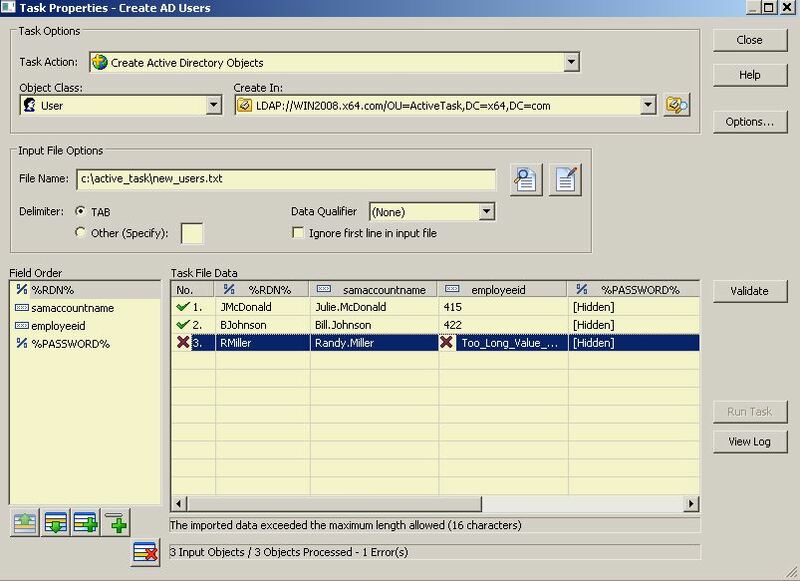 Dovestones AD bulk tool allows for importing from more than just a csv or spreadsheet, it can import from SQL, MySQL and Oracle. This can be a nice option since new employees may already be entered into another system, such as HR. Dovestones bulk import does what you would expect for importing accounts, it does have some additional features that are worth mentioning. It has a built in scheduler to help fully automate user creation, command line support and wildcards for preparing your import data. Pricing is $99 for a single license. I hope this article helped you find some options for creating accounts in bulk. There are other tools on the market but the ones I reviewed in this article I believe are the best. My recommendation is PowerShell as it allows the most flexibility and can be customized to meet your needs. If you just need a fast and simple solution to importing from a csv, then I would look at the SolarWinds bulk import tool. If you need a tool that is loaded with features and comes with support then the paid tools I listed are what you want.